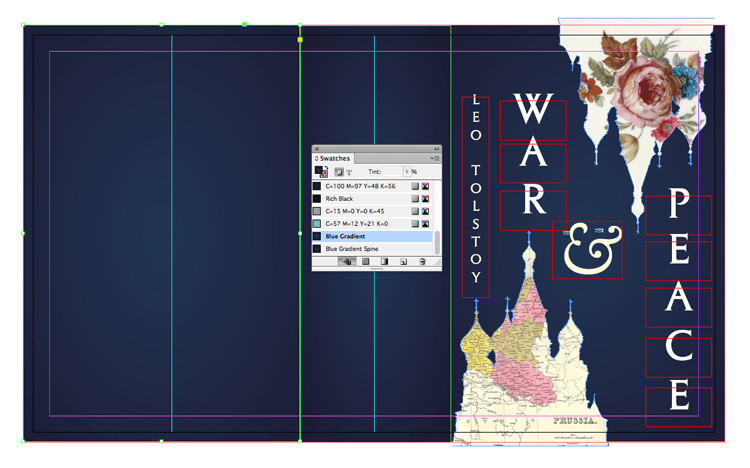 In this simple-to-follow tutorial you’ll learn how to create a full paperback book cover in Adobe InDesign, and take away a template for using with other cover projects. 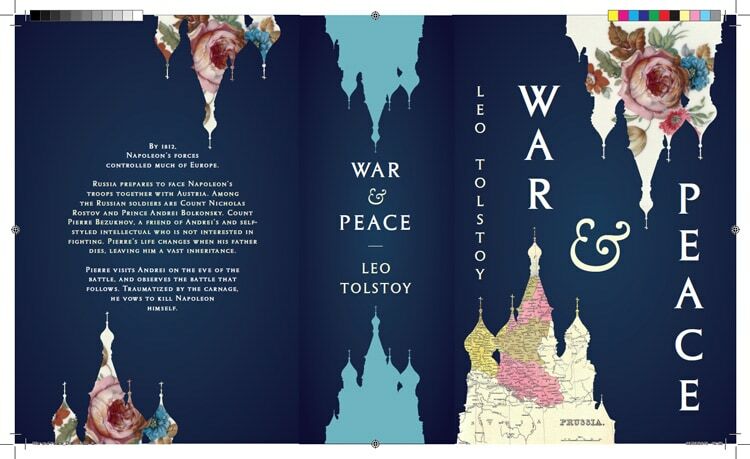 As an example, we’ll redesign a paperback cover for War & Peace, and give it a distinctively modern design. 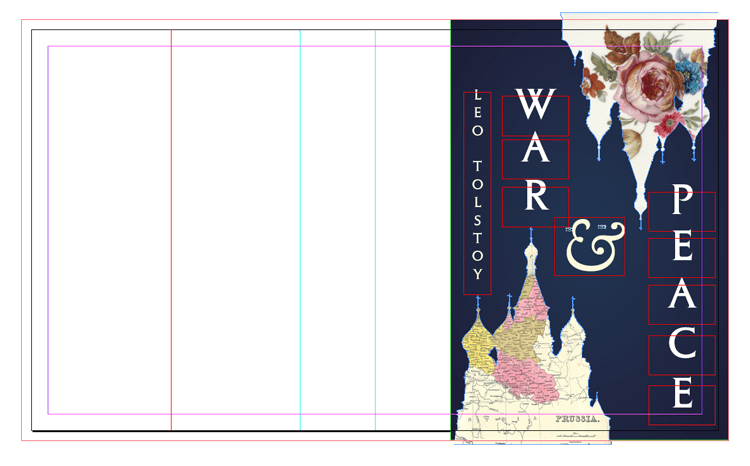 It’s always best to design the front of your cover only first, before you create a full cover, with spine and back. This will allow you to visualise the arrangement of type and images, and judge how well elements are centered on the page. Duplicate the front page, and keep the original as a stand-alone front cover—this will be useful for online promo shots, and eBook covers. You should expand the duplicate page using the Page Tool, and expand it to the full width of the cover, including both front and back cover widths and a spine width (we’ll look at this in more detail below). 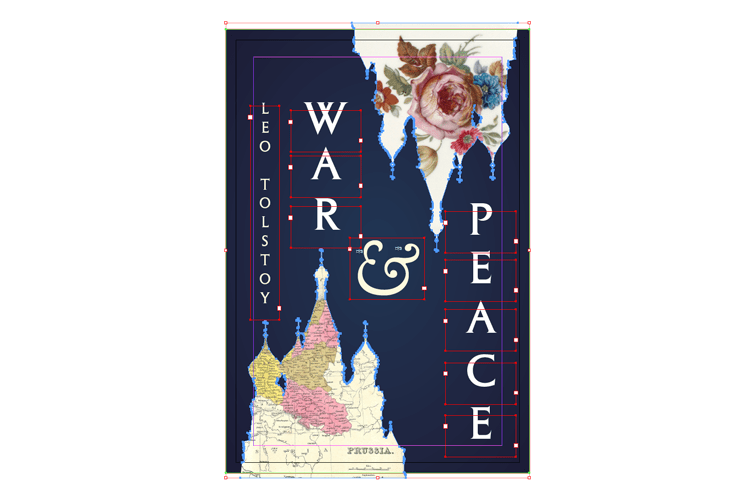 In this tutorial we’ll look at giving Leo Tolstoy’s War & Peace a modern makeover. 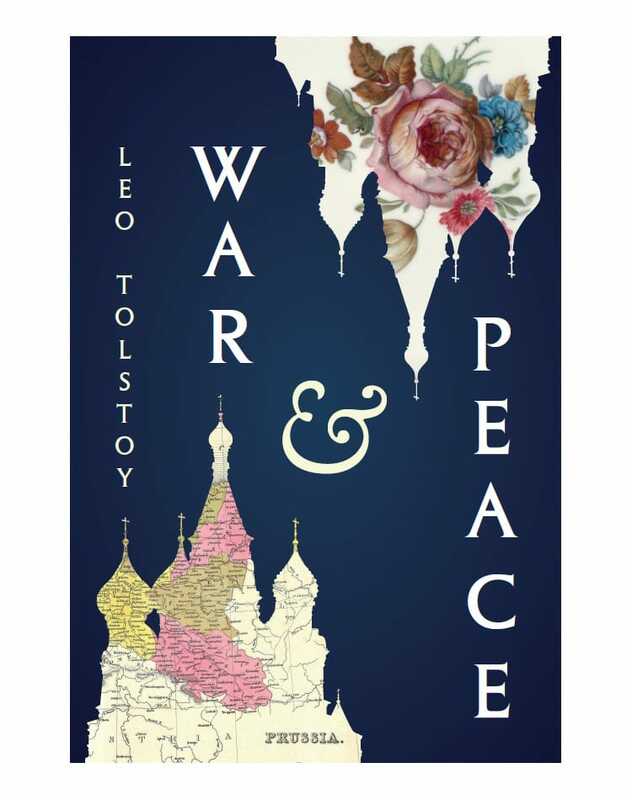 I’ve tried to recreate the mood and theme of the book, with collage-style silhouettes of St Basil’s Cathedral in Moscow—one filled with an image of floral-printed china, to represent peace and domesticity; and the other filled with a military-style map of Prussia, to represent war. Redesigning covers for classic novels is becoming increasingly common in publishing design; allowing publishers to market vintage classics to new, younger audiences. Discover some of the best examples of recently redesigned covers here. 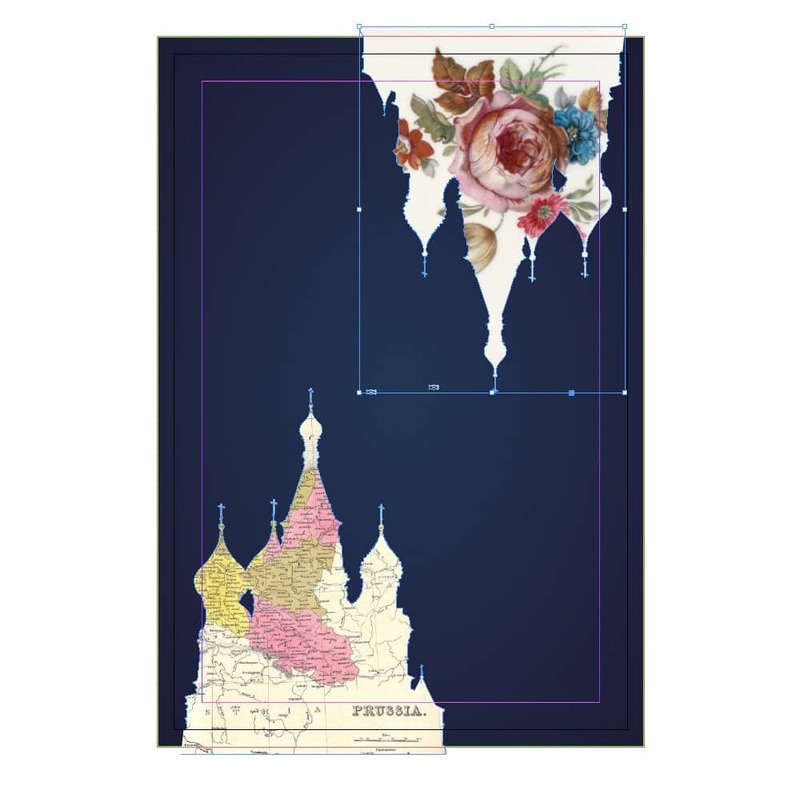 You’ll learn how to set up a paperback (softcover) version of the full cover in Adobe InDesign and create a collage effect with the help of Adobe Illustrator. We’ll bring in a bit of stylish typography too, to give the cover a modern design. 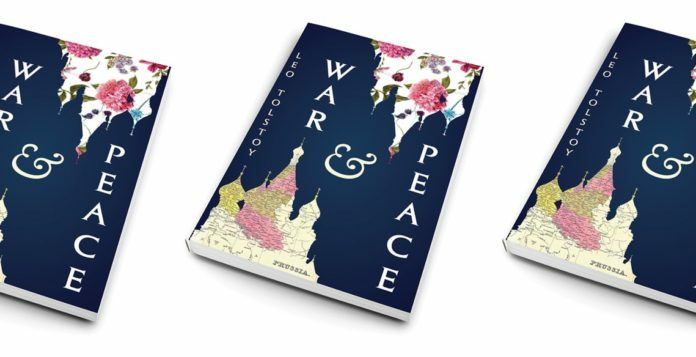 This design style can be adapted to all sorts of book covers—just switch up the silhouette and inside image! 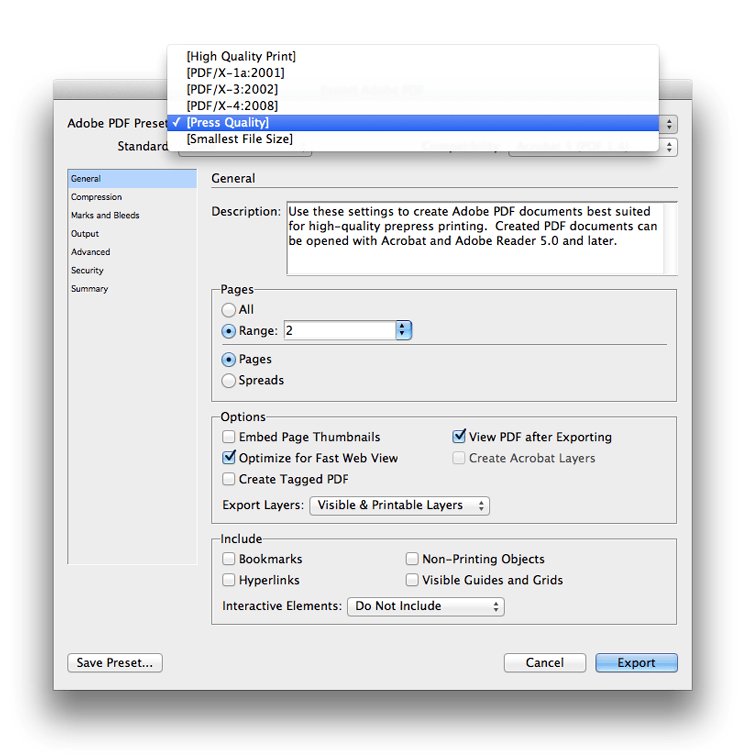 Go to File > New > Document, and set the Intent of the document to Print. Increase the Number of Pages to 2 and deselect Facing Pages. From the Page Size menu choose Custom. 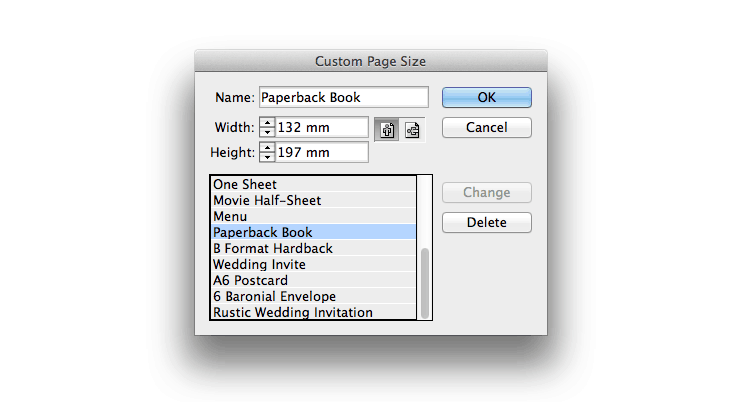 Name the custom size Paperback Book and set the Width to 132 mm and Height to 197 mm. Click Add and then OK to return to the New Document window. Expand or open the Swatches panel (Window > Color > Swatches). 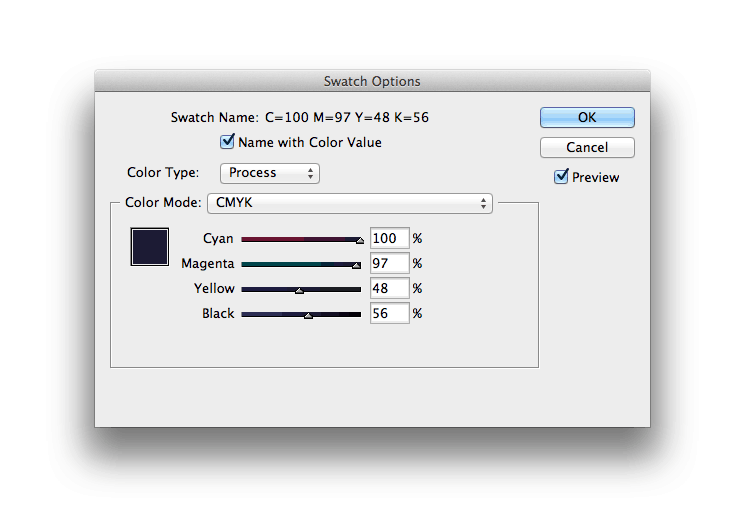 Create a new CMYK Process swatch, C=100 M=97 Y=48 K=56. 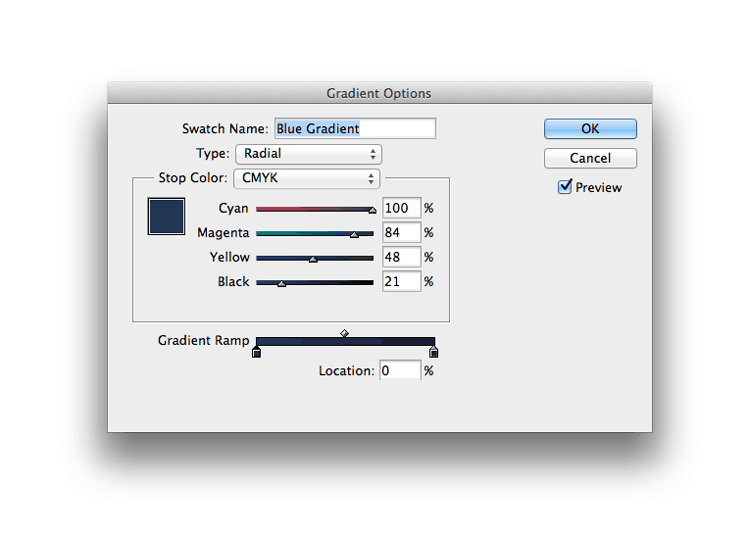 Click Add and OK.
From the Swatches panel’s drop-down menu choose New Gradient Swatch. Click on the right-hand stop and adjust the Stop Color to Swatches. Choose your new swatch, C=100 M=97 Y=48 K=56 from the list below. Click OK. 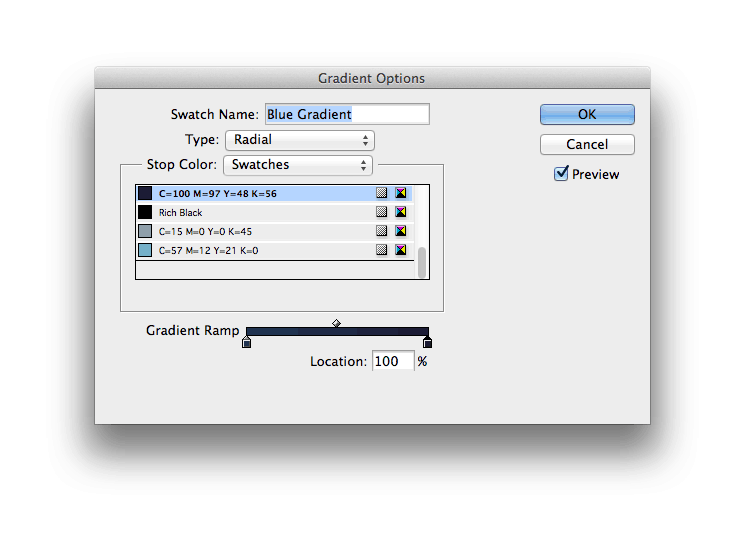 Apply the Blue Gradient swatch to the Fill Color of the rectangle shape. This will apply a lovely subtle gradient to the background of our front cover. 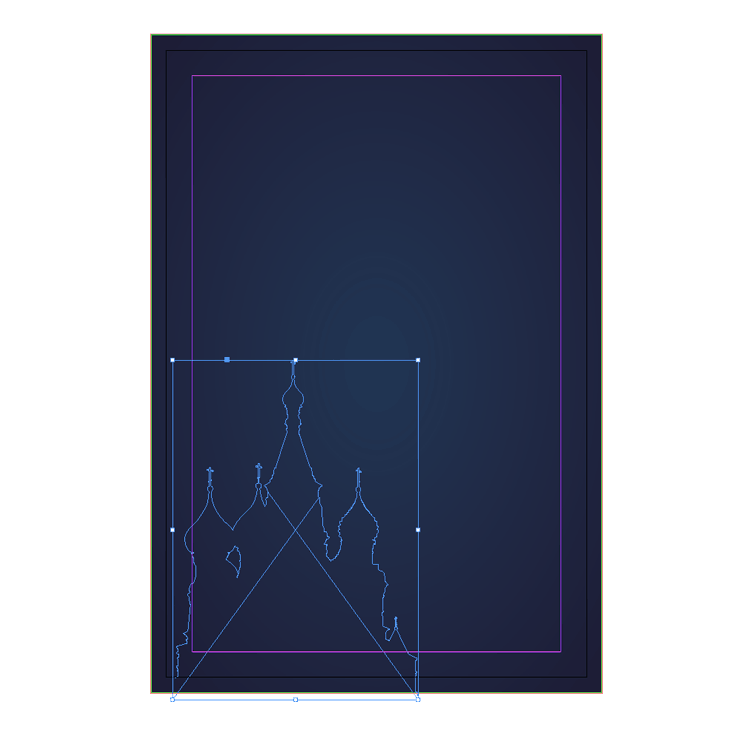 Lock the bottom layer, Background Color by clicking in the blank space to the right of the eye icon, next to the name of the layer in the panel. Now we’re ready to start working on our cathedral graphic! 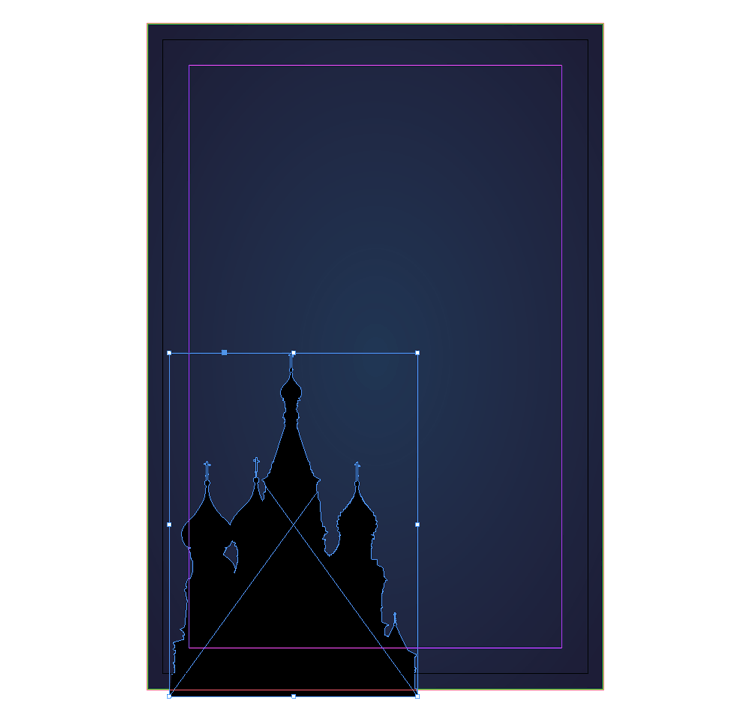 To make our collage-style cathedral, we need to first create a basic vector silhouette of the cathedral, and then, a bit later, we’ll fill it with a photo image. 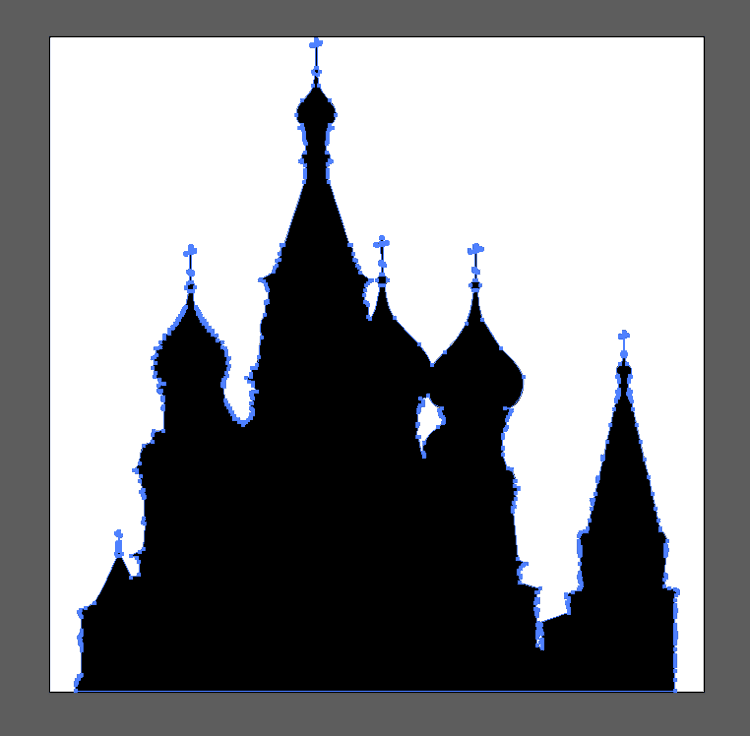 You can download a ready-made vector image of St.Basil’s Cathedral here. Making sure your silhouette has only a simple black fill and no stroke color, select it, and then go up to Edit > Copy in Illustrator. 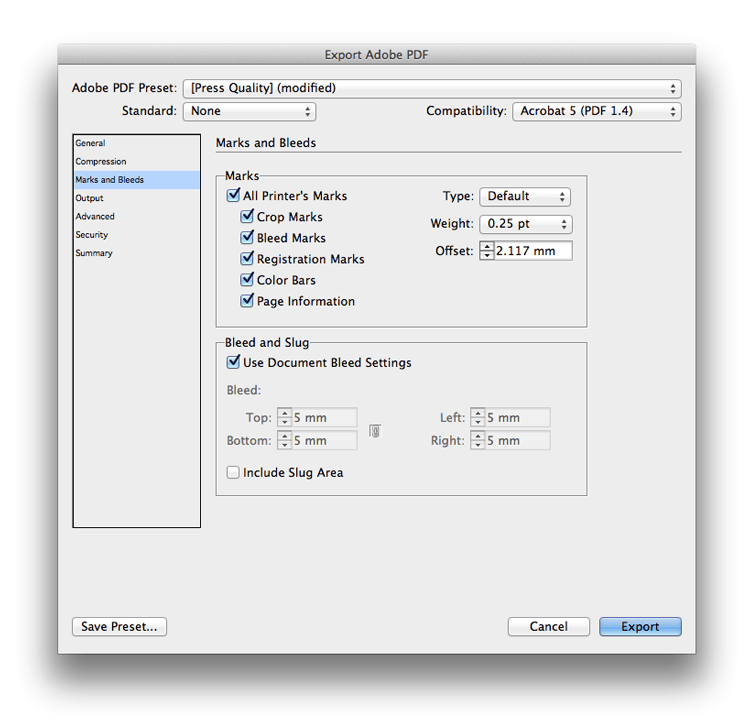 Return to your InDesign document and Edit > Paste the vector onto Page 1 of your document. 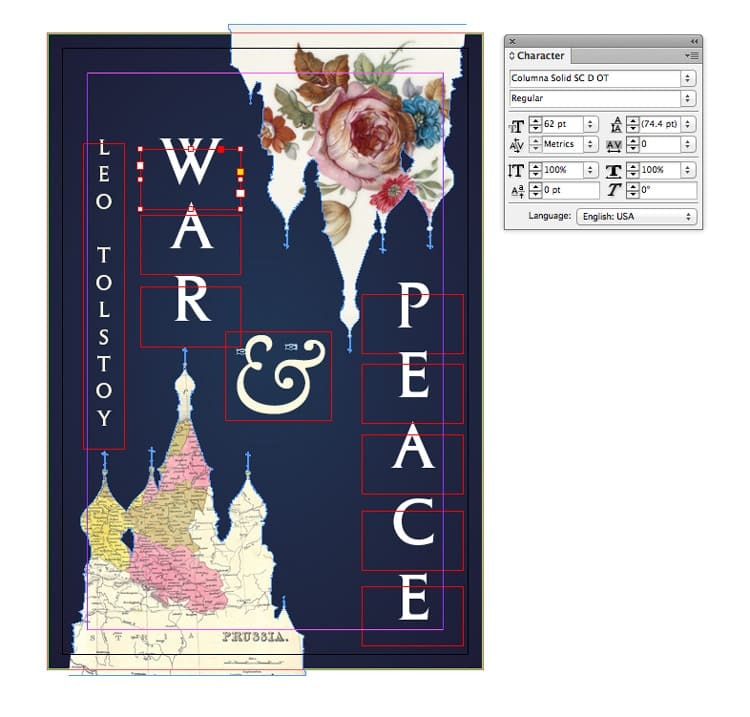 Hold Shift to adjust the scale of the pasted vector. From the Swatches panel (Window > Color > Swatches), set the Fill Color of the vector to [None] to get rid of the [Black] fill. Next up, you need to choose an image to ‘fill’ the cathedral silhouette. I’ve chosen a commons image of an antique map of Prussia, which you can download here. Download the image and return to your InDesign document. With the vector selected go to File > Place and choose the map image. Click Open. Click on the Fill Frame Proportionally button in the top control panel to size the image to the frame. Double-click inside the vector frame to manually adjust the scale of the image, holding Shift while you do so, to make sure you’re happy with the effect. Make sure the image extends across the whole of the silhouette. Select the vector and Edit > Copy, Edit > Paste. Ctrl-Click (Mac) or Right-Click (Windows) > Transform > Flip Vertical. Position this flipped cathedral at the top of the page, and go to File > Place. Choose a different image to fill this vector with—to represent ‘Peace’—I’ve gone for a photo of a vintage china plate, which you can download here. 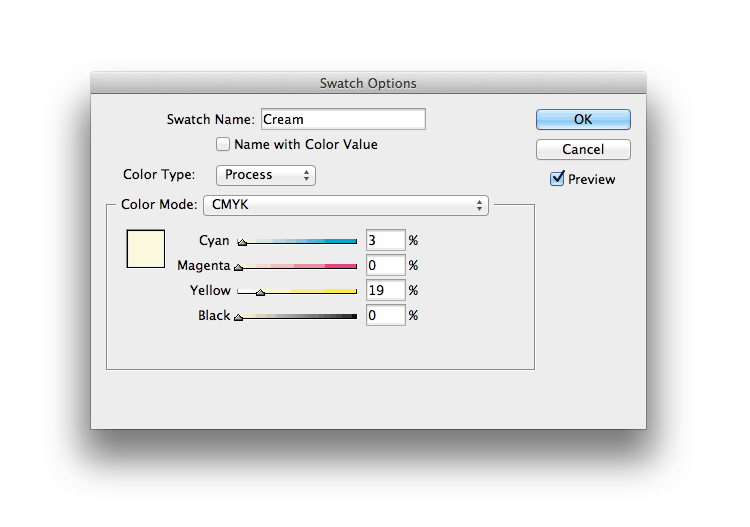 Create a new CMYK Process swatch, C=3 M=0 Y=19 K=0, and rename it Cream. Unlock the Typography layer and use the Type Tool (T) to create a series of text frames on Page 1. Here I’ve used the Columna Solid typeface for most of the text, with the central ampersand set in Adobe Caslon Pro. Set individual characters in separate text frames to be able to have more freedom with how you place the type on the page. Set some of the text in [Paper] and some in your new swatch, Cream. 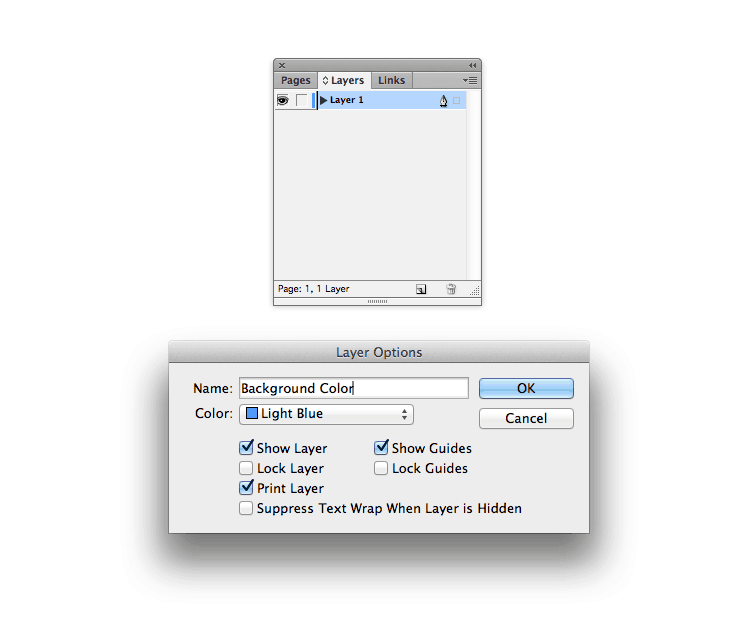 Unlock all the layers in the Layers panel, then drag across Page 1 to select everything on the page. Edit > Copy, then scroll down to Page 2 of your document. 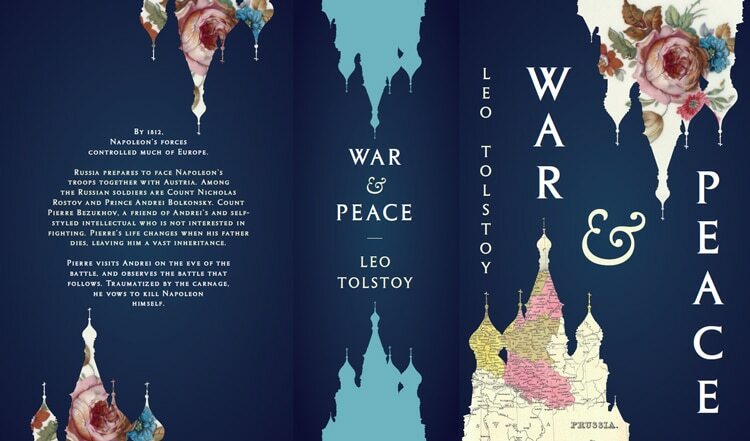 Using this I’ve worked out that to accommodate for 1456 pages (the length of War & Peace—yup, it’s a long one!) printed on white offset 80 gsm paper, we will need to have a 73.7 mm spine width. From the left-hand ruler pull out a guide to X position 137 mm, to mark out the left edge of the spine. Finally, pull out a third guide to 68.5 mm, to mark out the center of the back cover. 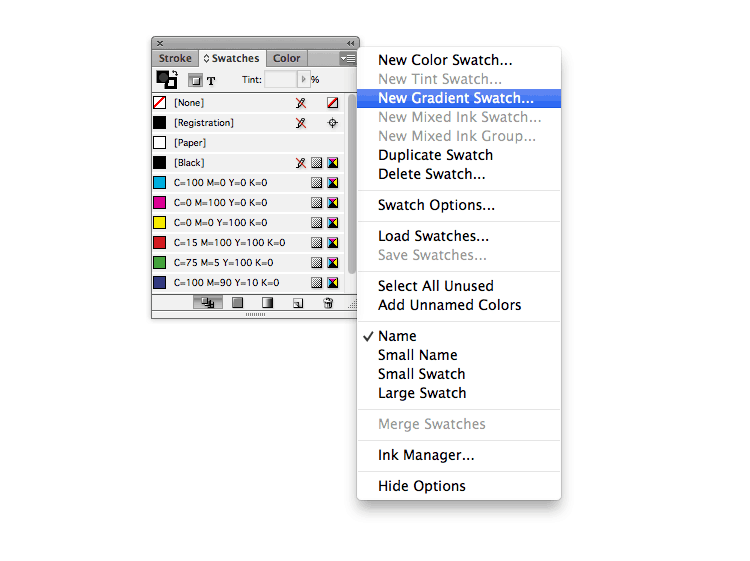 From the Swatches panel, click on the Blue Gradient swatch to select it, then click on the New Swatch button to duplicate it. 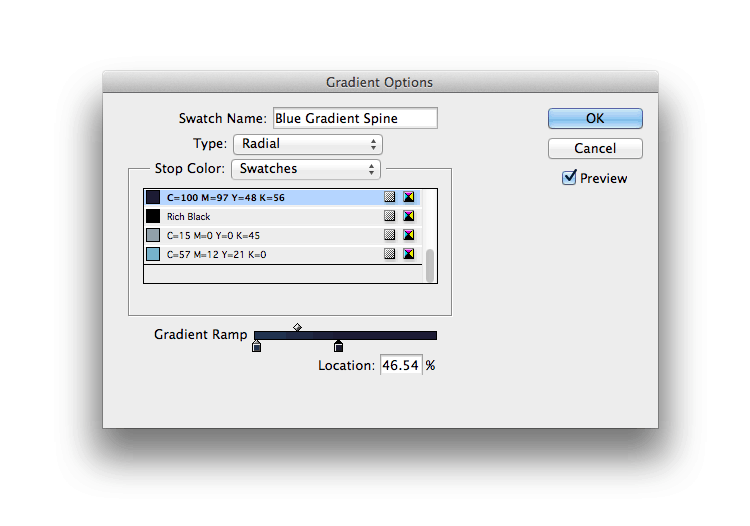 Rename the swatch Blue Gradient Spine. Keep everything as it is, just move the right-hand stop on the Gradient Ramp to the left, until you reach about 46%. Click OK to save your edits. Use the Rectangle Tool (M) to create a shape that extends across the spine, and up to the bleed on the top and bottom (73.7 mm in Width). Set the Fill Color to Blue Gradient Spine. The gradient on this is a bit tighter, so the lighter tone will not extend too far away from the central part of the spine. 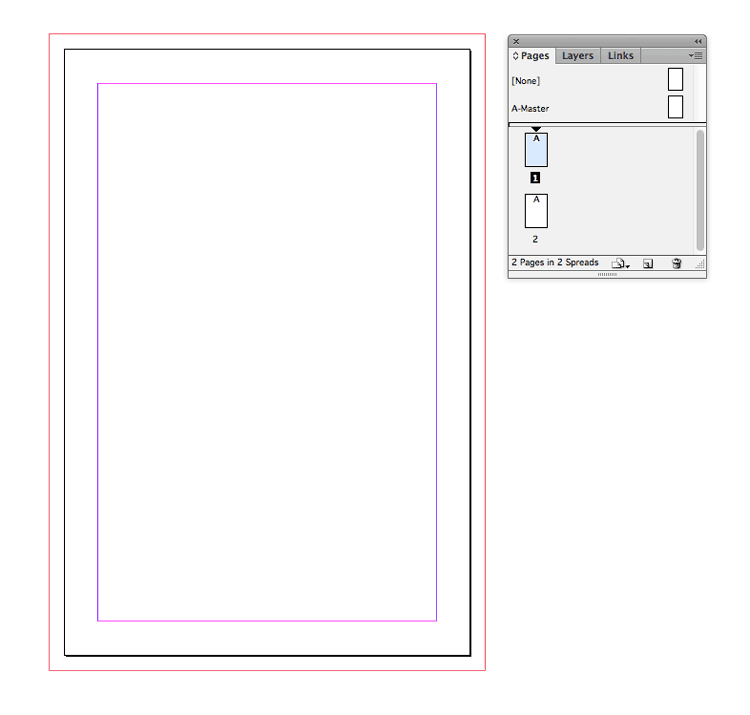 Create a second shape using the Rectangle Tool (M), extending it over the whole of the back cover, up to the left edge of the spine, and up to the bleed on the top, left and bottom edges of the page. Set the Fill to Blue Gradient. 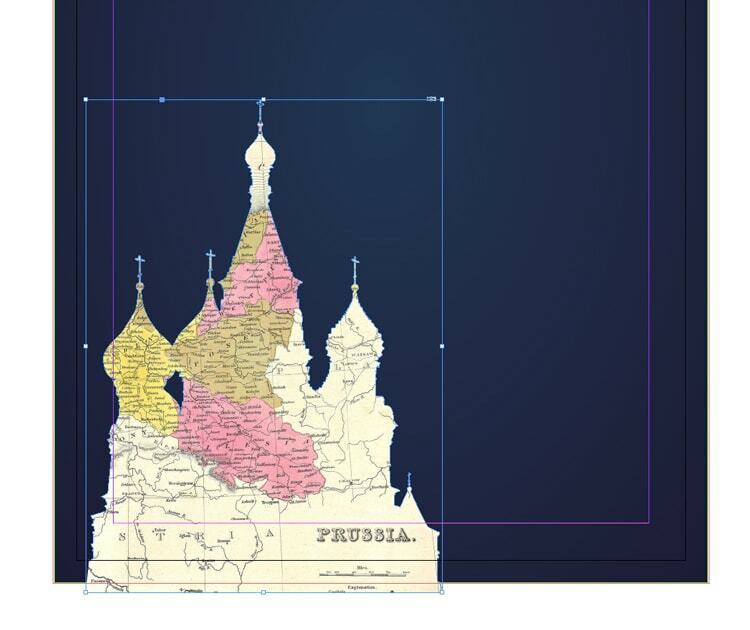 Copy and Paste the cathedral vectors on the front cover, onto the back cover, and arrange them as shown below. You can switch up the fill image of the vectors too, if you like. Paste a couple of vectors onto the spine too—here, I’ve removed the image fill, and given them a pale blue Color Fill, C=57 M=12 Y=21 K=0. Zoom into the spine and create a few rows of text frames using the Type Tool (T). Type in the title, allowing one text frame for each line of the title, and mimic the typography formatting used on the front cover but at a smaller Font Size. 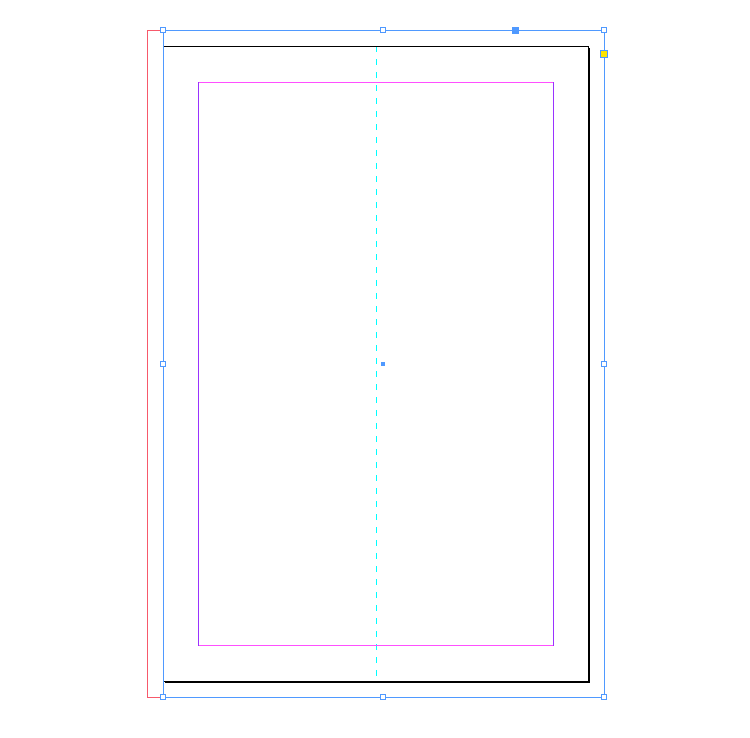 Set all the text to Align Center and make sure the frames are perfectly centered along the center guide. Use the Ellipse Tool (L), and hold down Shift, to create a circle on the center of the back cover. Select the Type Tool (T) and click into the circle to transform it into a text frame. 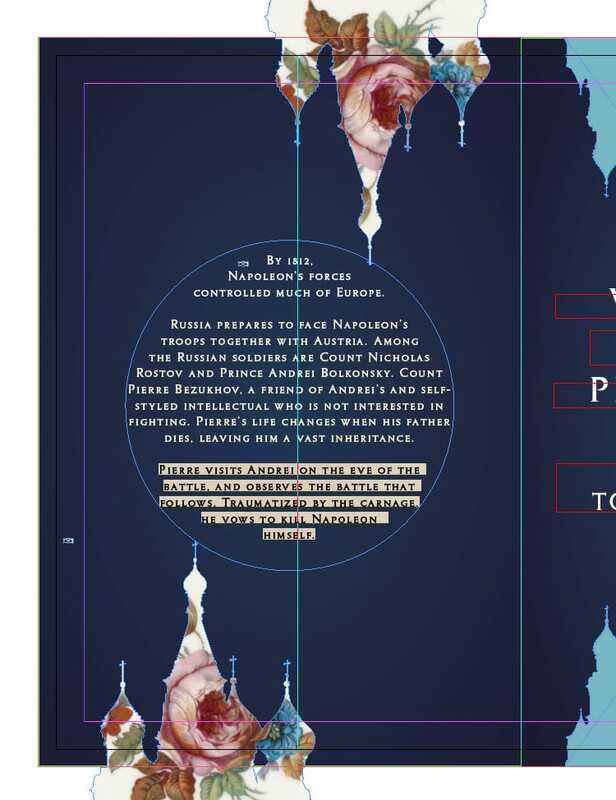 Add a blurb to the back cover, aligning the text centrally. Here, I’ve set the Font to Columna Solid, Size 10.5 pt, Leading 13 pt. Use the swatch colors we created earlier to add a touch of color to the typography. The artwork for your paperback cover is finished, fantastic work! In this tutorial you’ve learned how to give a classic book a modern makeover, and set up the full paperback cover in Adobe InDesign. Awesome work! 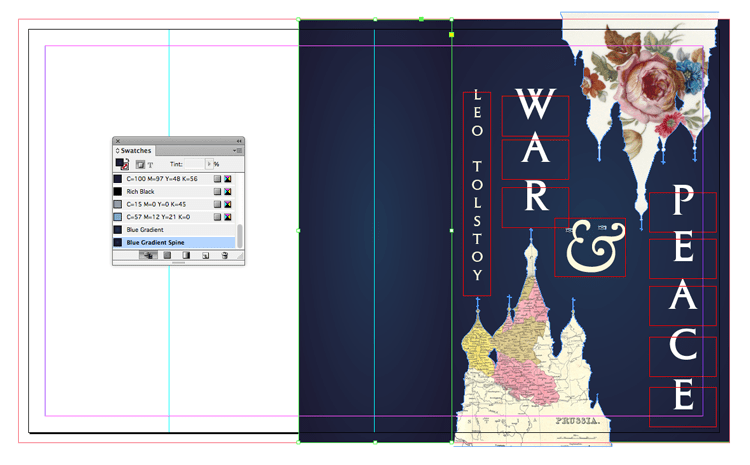 Looking for a free paperback book cover templates for InDesign? 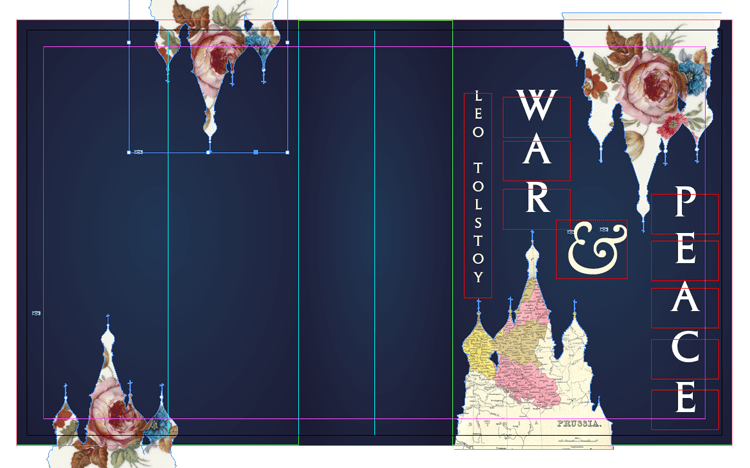 Fully editable design with front cover, spine and reverse. Download free! 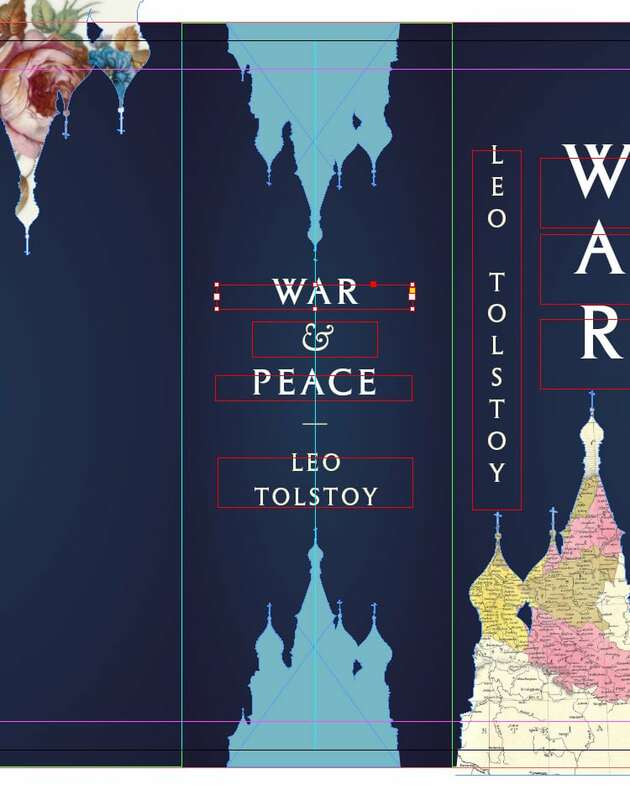 Typography can make or break a book cover design. The huge variety of typography on covers is mind-boggling - from conservative serifs to charmingly handwritten typefaces. Book cover typography has never looked so good. 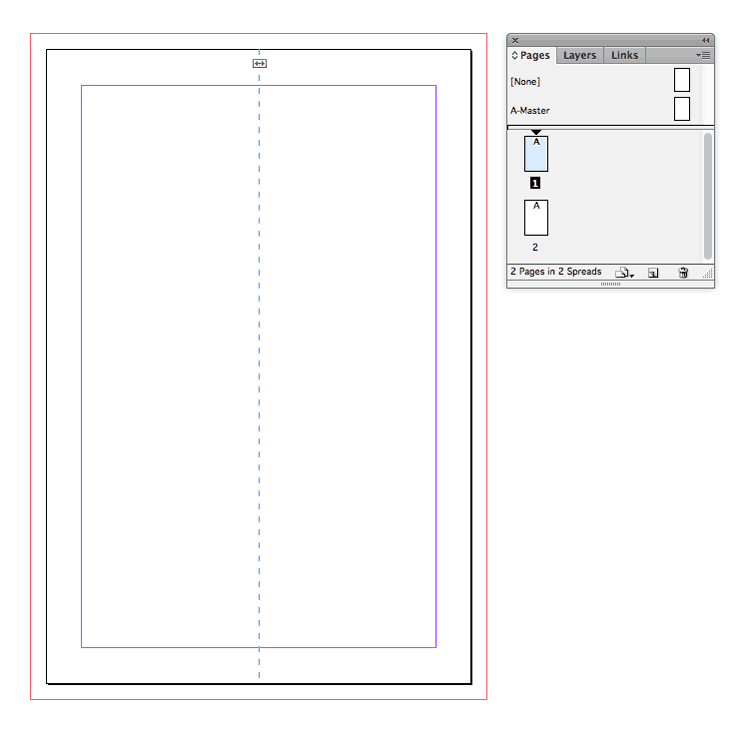 Full book template for InDesign. 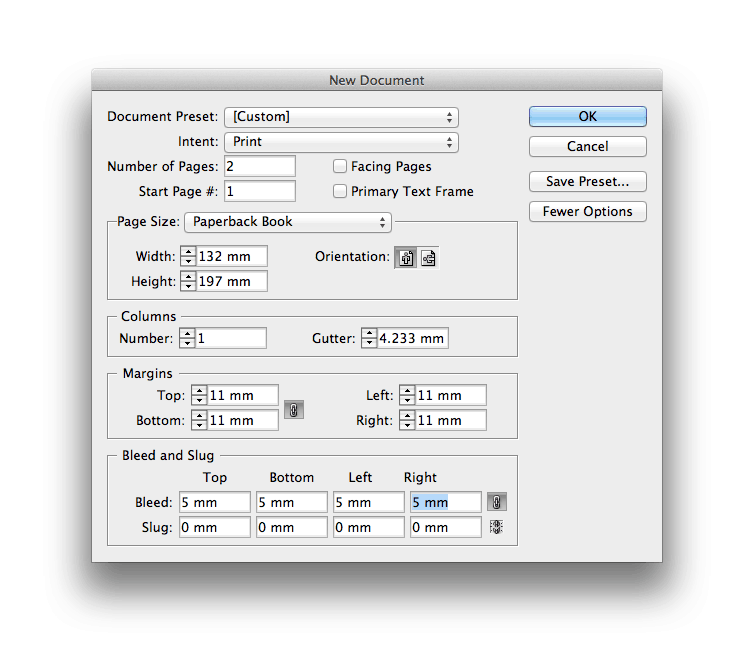 Template for paperback book interior including: page numbers, contents & chapter headings. Download free! Want a free paperback cover InDesign template? Of course you do! Find it on our Templates page. 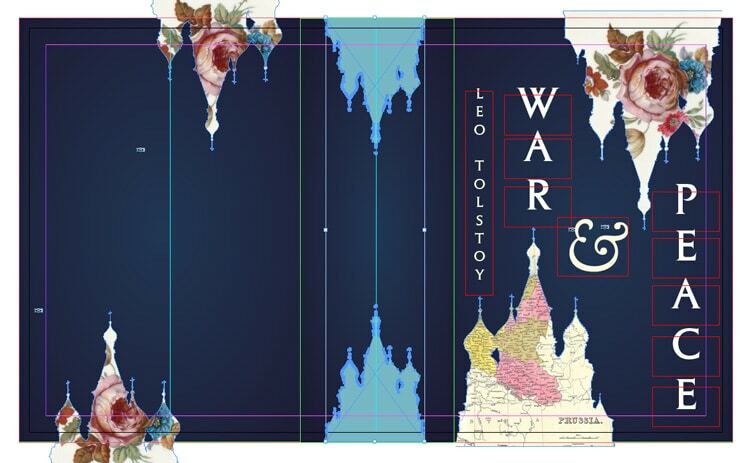 Looking for some book design inspiration? Head over to our Inspiration page to pore over beautiful book covers, and find great ideas for book typography. 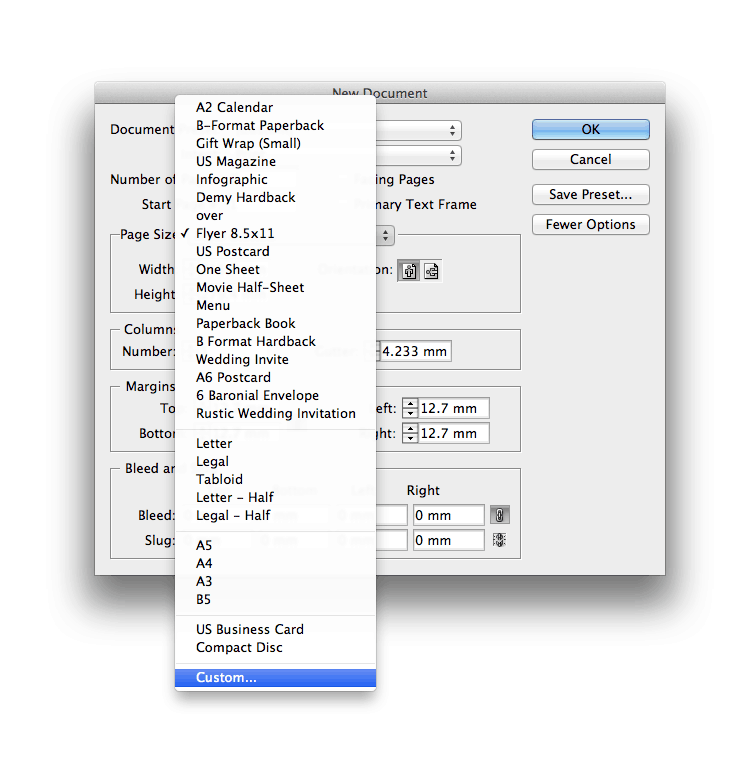 Find out more about creating inside pages for your books with this straightforward tutorial.